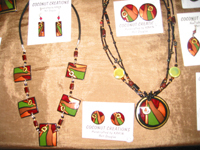 Coconut jewellery created in the tropics makes inexpensive gifts. 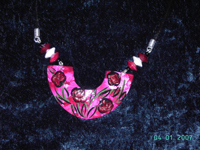 Coconut Jewellery, Stylishly in Fashion, Makes Inexpensive Gifts. Stylishly in fashion, colourful coconut jewellery is eye- catching and so light and comfortable to wear. 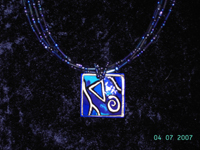 Its creator, Karin Dorn has, after all, had lots of practice at getting it just right. For twenty years she has been honing her skills and presenting coconut earings and necklaces to delight visitors to the Port Douglas markets. Improbably, she chose coconut shell as her medium. But, of course, she didn’t really have a choice in the matter – it just happened, in such a serendipitous way. As a young student from Germany, Karin’s plan was to study horticulture in Australia. But then, she found Port Douglas and stayed – and played - with coconuts, cutting the coconut shells and, initially, making bowls for sale. But then, by cutting the coconut shells into small pieces and adding silver wire she was able to make attractive and functional, eco-friendly products for herself and friends. 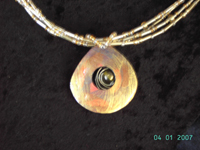 This original coconut jewellery was so popular that she was encouraged to make more until she was working full time at her craft. 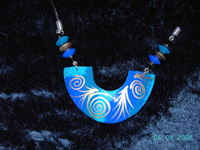 Karin's pink and blue coconut pendants - so light to wear! Which coconut jewellery for you? 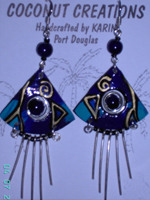 I still have several pairs of Karin's coconut earrings made fifteen years or so ago – and I still love them! Brightly coloured, appearing to use tribal designs with its added natural beads, sometimes finished with gold or silver lines, the jewellery complements the casual lifestyle of the tropics as well as dressing up more formal outfits when visitors return “down south” or overseas. It’s a happy feeling for them to take a little piece of the tropics home with them as a reminder of a wonderful holiday or as light-weight and inexpensive gifts. 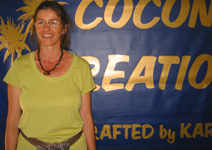 Coconut Creations can be found under the big raintrees in the centre of the markets – every Sunday! Don’t forget to say hello to Karin and tell her where you first saw her photograph – here!